I know this is gonna sound hokey, but “Don’t Breathe” left me breathless. Horror aficionados or those more accustomed to shocks and twists that edge into the perverse, may find this film from Uruguayan director Fede Alvarez (whose commanded legitimate scares in 2013’s “Evil Dead” a remake of a Sam Raimi classic and proved himself an atmospheric filmmaker to keep tabs on) to be something of a lightweight, but that’s on them. While I wouldn’t necessarily consider it a horror flick, “Don’t Breathe” is more of a chiller or a home invasion thriller (a sub genre that’s grown over the years), but you’re better off trying not to genre-label this one. It’s a suspenseful nail-biter of a movie that surprised and impressed me, delivering fine performances, smooth cinematography and a tight screenplay, evoking something from Rami himself, Wes Craven or even Alfred Hitchcock. The movie follows a trio of lucky thieves who’ve found success robbing affluent homes in Detroit. They’re lucky because so far, none of these inexperienced or skilled twentysomethings have gotten themselves caught. Led by the bold Raquel “Rocky” (Jane Levy, who was in Alvarez’s “Evil Dead“) and assisted by her sloppy and impetuous boyfriend, Money (Daniel Zovatto, last seen in “It Follows“) and enabled by Alex (Dylan Minnette, a long way from “Goosebumps“), a guy who crushes on Rocky and whose father runs a local security company that provides them with easy access to their targets. Their goal is to score enough cash (or pawn enough items) to escape the city, with Rocky specifically aiming at getting both her and her little sister out from under their dysfunctional squalor, inviting her two partners in crime as well. Through a shady source, Money is tipped off about a potential $300,000 payday hidden inside a house owned by a Gulf War veteran (Stephen Lang), nestled in a dilapidated neighborhood. When they case the joint, the group realize the homeowner is blind, which makes them believe this is a heist that will be easier than others. They figure they’ll break in late at night while the homeowner is asleep and be in and out without a hitch. They were wrong. Due to their overconfidence (Money in particular) and lack of thorough planning, the trio soon find themselves trapped and pursued by an awakened Blind Man (he’s never referred to by name) who turns the tables on his intruders, knowing his home better than these unfortunate crooks. Maneuvering their way through hallways, hiding in closets and dealing with a labyrinthine basement, the young criminals desperately search for an escape, while discovering this Blind Man has more stored in his house than a load of money. Ordinarily, I don’t like it when a movie begins with an ending and then asks that we watch what has transpired leading up to that opening (ending) scene. It happens often actually, especially in the thriller/horror genre. I just prefer to watch a story play out in chronological order, especially when its a suspense tale, instead of wondering how we’re going to get to that specific scene in my mind, as I’m watching the story unfold. But the opening of “Don’t Breathe” had me hooked. I knew it wasn’t the beginning of the story, since I knew it was a home invasion thriller – regardless, Alvarez’s opening found me paying attention more than I thought I would going into this movie. No, I’m not going to tell you about the opening, just as I’m not going to tell you much more than what I’ve already told you. It really has to be discovered all on your own. If anyone ruins that experience for you, cross them off your friends list, because knowing very little going into “Don’t Breathe” is the optimal way to take in this truly terrifying movie. Alvarez and co-writer Rodo Sayagues (who also worked on “Evil Dead”) , waste no time providing efficient characterization for the three young actors, knowing full well its best to get down to the business at hand as soon as possible. Yet it’s evident right away how tight their screenplay is in both the introduction of who these characters are, their motivations and the world they inhabit. They waste no time here, which is quite refreshing in a movie like this. I already have an idea what kind of movie it will be, so I’d prefer that it just gets going and leave any lingering for the heart of the story when the suspense is already palpable. That being said, the way in which this story goes about revealing what kind of movie it is, becomes something I was completely enthralled and surprised with and much of that has to do with the technical aspects of the movie. Throughout “Don’t Breathe”, Alvarez and cinematographer Pedro Luque provide viewers with a clear understanding of placement and movement in a story that predominately takes place in one location. They invite the audience There’s also a heavy reliance on sound design here, which is no surprise considering we’re watching a blind man use his remaining senses to hone in on his trespassers and watch as he becomes a real threat. As the camera glides through every hallway, along floorboards and crevice in each wall, we also hear all the creaks, cracks and pops that could be heard by Lang’s Blind Man, while the young invaders try to remain undetected. It makes for a very immersive and nerve-racking experience that heightens the thick tension of the atmosphere. It’s an all-around impressive feat, excellently executed and exactly what I’d want in a movie like this. 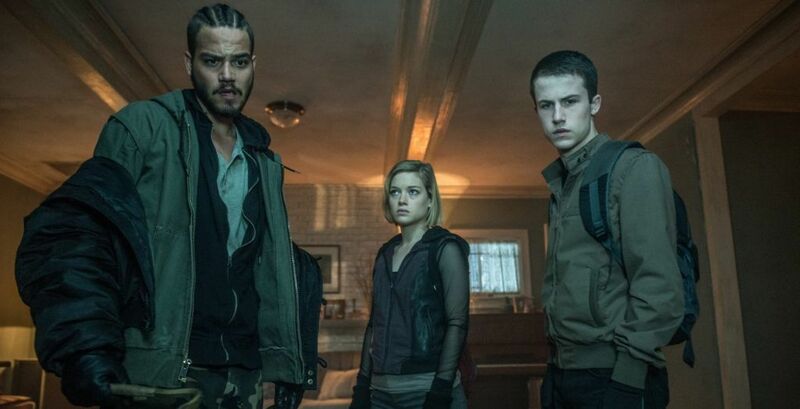 In a home invasion chiller like this, there’s always going to be familiar characters and while “Don’t Breathe” has them, the movie also flips how we gravitate toward them. Usually such a movie is told from the perspective of the homeowner, who is generally the one we root for and hope survives or even flips the scenario on the intruders. The intruders are the ones we usually fear in such a movie. We may get some of their backstory to offer the antagonists some layers, but ultimately we hope they get what’s coming to them. Alvarez and Sayagues know these expectations and flip them. While Money and Alex are kind of one-note characters, they’re not depicted as evil, cruel or malicious – they’re just dumb and infatuated, respectively. Not necessarily what we’d expect from criminals. In many ways, Alvarez is doing here what Hitchcock did with “Psycho”, by having viewers follow a likable criminal into a situation that leads to a deadly character. Rocky certainly has a motivation that we can all relate to – she wants a better life for her and her sister and needs money quick to see that happen. We later discover she’s willing to risk her life, not just to survive, but also to maintain the money she winds up stealing from the Blind Man. The deeper she gets into her dire situation, the more we feel for her, but she’s still breaking the law. Is she getting what she deserves? Well, not in the way we’d wish for her. Levy plays Rocky as both desperate and feisty and understandably frightened as she fights for her life. And then there’s Lang as the blind homeowner whom the three youths fatally underestimate. Anyone familiar with what Lang is capable of as an actor, knows full well that he’s not going to be playing a helpless victim here. We also already know that writing off a blind war veteran as harmless is a dumb move – but again, these aren’t smart kids, they’ve just been lucky. Wearing haunting contact lenses to depict his character’s disability, Lang plays his role with a feral intensity. His body language is also superb here – a tilt of the head, a sniff in the air, crouching like a panther – feeling like a visitor from another world studying his environment, ready to defend what’s his. But there’s also a degree of desperation to his character, which Lang slowly shows the more he finds his well-contained domain. The more we learn about him, the more disturbed we are by the monster he is, yet the warped motives Alvarez and Sayagues gives the character for his repulsive actions that are warranted albeit still disturbing. He may have under ten lines, but Lang’s portrayal will certainly be one of the most memorable of 2016. 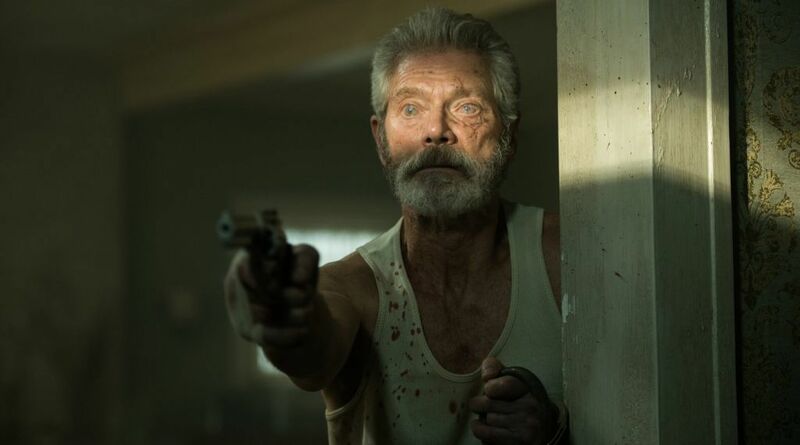 Within the second half of “Don’t Breathe” there are a couple twists that will also become some of the more memorable moments in cinema this year – for better or worse. One is so unrelenting in its depravity that it actually impressed me how uncomfortable it made me feel. Based on the audible gasps from the audience, I wasn’t alone. Although my bet is some were much more unnerved and angered than I was. I was too busy being shocked and impressed with how it was all unveiled. The other twist, is…well, it’s a revelation that solidifies what can be done with clever camerawork when the audience is emotionally invested in the moment. “Don’t Breathe” becomes many things – a subtle statement on the desperate measures those in financial need will take and also a look at the depravity of a broken and haunted soul. It’s a combined survival and home invasion tale (I haven’t even mentioned the Blind Man’s ferocious dog) that is both relentless and merciless. All of this makes it simple fun, for those who are into the genre. “Don’t Breathe” is not as bloody or gruesome as Alvarez’s “Evil Dead”, but in many ways he’s a better movie because of it.